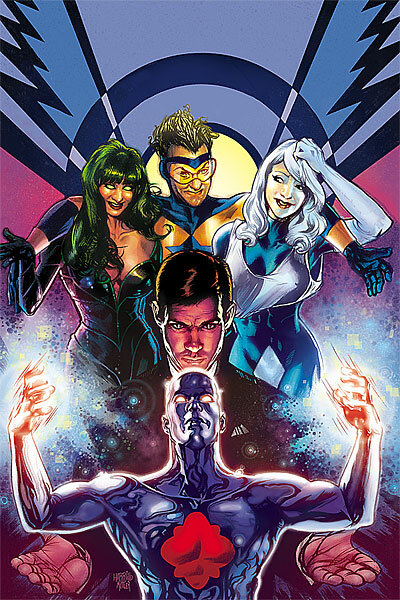 Depending on who you listen to and/or read, the dawning of the digital age of mainstream comics is either the new lifeline the comic industry needs to survive — as three million iPad owners will now flock to read to DC and Marvel’s iPad apps, or their Playstation 3s to read J. Michael Stracynski’s Superman — or it’s the death knell of the direct market, as a couple hundred thousand comic book buyers will abandon their local comic book shop and jump ship to the digital market. Another reaction is that the current state of digital comics is not really any news yet, as people try to show how cool and nonplussed they are over another technological wonder. Either way, we’re at a potential turning point. Thanks to the iPad, iPhone and Comixology, there’s practically a comic shop on every computer the same way that there’s at least two or three music stores in every computer. 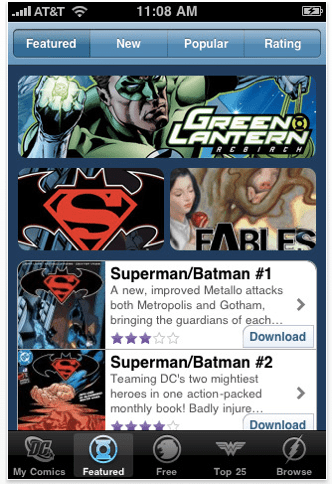 Comixology, through the best and most neglected part of its digital initiative — their online comic viewer — puts DC and plenty of other digital comics on every laptop and desktop computer. The delivery system that we’ve all been waiting for is now in place; we have digital almost the same way that we have music. So, now what? The revolution has been fought and broadcast via broadband; Comixology and Apple won. Now it’s time to put our best foot forward and show everyone what comics really are. DC putting their comics out there via the Playstation 3 and Comixology is no longer a risk; it was a necessary step in the evolution of comic book distribution. But the really big news out of DC was the plan to release all future issues of one of their twice-monthly miniseries online the same day that the comic shops get theirs to sell. After Marvel’s understandably hesitant steps with a day and date release of an upcoming Iron Man annual, DC goes out and announces that the next 20 issues of Justice League: Generation Lost, a large project tying into DC’s Brightest Day event, will be available digitally hours before most stores open on Wednesdays. At least Marvel is releasing the Iron Man annual digitally a few months after an Iron Man movie. There’s evidence that a large number of people recently were hungry for an Iron Man story, as the character has now become one of those cultural touchstones that almost everyone knows. But Justice League of America? And not even the Justice League of Batman, Superman and Wonder Woman, but the Justice League of Booster Gold, Captain Atom, Fire and Ice, affectionately known as the “bwah-ha-ha” League of the 1980s? DC is making its grand experiment with intellectual properties that were popular 25 years ago. I doubt that DC will attract many new comic readers who have no idea and don’t care who Booster Gold is. The person that may look at Generation Lost and buy an issue or two is the one-time comic reader, that reader who was around buying every mainstream book back in 1985 but dropped out of the hobby sometime during the years after that. Here we have a comic fan or, at least, someone who once liked comics seeing something on their new iPad and they may want to check it out.. And who knows, they may like it and come back to buy more comics. The short-term appeal of Marvel and DC’s digital apps which no one is talking about is how can they bring back readers who, for one reason or another, went cold turkey on comics and haven’t been back to their comic shop in years. We always talk about the mythical “new reader,” but we hardly ever talk about how do we win back that audience who has disappeared over the years. I think we just kind of assume that either they’ll be back or they won’t. That’s where I think the brilliance of DC’s selection of experimenting with Justice League: Generation Lost comes in; it plays almost perfectly to the 35-40 year old potential fan of today who may just notice a bit of their childhood while skimming around, looking for something new to do with their iPad. It’s not preaching to the converted and it’s not trying to reach the untapped; it’s going after the lapsed. Obviously it’s not enough just to give them the Justice League of 25 years ago or an Iron Man annual that features a villain who wasn’t in either of the movies. That’s merely a door opener; the bigger challenge to DC and Marvel, and to anyone getting into the digital comics game, is how do you get them to come back and buy comics until it become a habit? And here the answer is both incredibly simple, impossibly hard and a bit of a cliche; content is king. Now that we have digital distribution in place as an alternative to an outdated physical system, it’s time for the real revolution to begin. We need the comics that people will want to read. Not comic fans, but people. The true comics revolution will only happen when the comic books and webcomics are there to support it. Comics have the potential to reach a wider audience than it has in a long time and it’s time to show those people what comics can be. DC’s Lost Generation is the perfect way to attract current and older comic fans to their iPad app, but DC is using one of their best outreach comics of the ’90s, Neil Gaiman’s Sandman, as a way to weekly bring the iPad fan back. For the next 75 weeks (give or take a week or two due to specials,) DC will be releasing an issue of Sandman a week. Here is a book with a proven track record of bringing in new readers to comics, of reaching a greater audience than just the regular Wednesday crowd. Bill Willingham’s Fables is another one of those titles in DC’s digital distribution plan that has the potential to reach a wide audience. Neil Gaiman is a sought-after brand name nowadays and here he is, available weekly on your own iPad. Digital comics are here, and they’re here to stay. I don’t think anyone from the fans to the retailers or to the creators would argue that they’re not. Now it’s time to put on our best face, maybe dust off a classic or three and open our metaphorical digital doors to the world. Hopefully apps like Comixology, Panelfly, Iverse, Marvel, DC, Boom and IDW’s iPad apps can give more people an entry point into comics –and after discovering the best we can show there, they’ll go and find the best that exists everywhere online and in your local comic shop.